John 3 may be most well-known for the most famous verse in the entire Bible, but in this chapter there is also the testimony of John the Baptist, a forerunner in the ministry of Christ. John the Baptist had his own band of followers, and drama ensues when John and co are baptizing at one side of the river, and Jesus and his disciples are baptizing at the other end. A competitive spirit is manifested amongst the disciples of John, escalating in them saying, well, he is baptizing, and everyone is going to him [John 3:26]. But John was not affected by the jealousy of his disciples. He reiterates his identity as simply a forerunner for Christ, and rejoices in the fact that his forerunning is complete – Christ – and his ministry, his word, his name – must become greater, while John – and his ministry, his word, his name – must become less. John the Baptist was very clear about his role and his identity. I am not the Christ but am sent ahead of him [John 3:28, 1:20]. The term ‘must‘ emphasizes his clarity of the matter at hand. Jesus himself said, the Son of Man must be lifted up, that everyone who believes in him may have eternal life [John 3:14]. These are two men using the word ‘must‘ in different contexts, but it shows the same thing – the extent of the clarity of their purpose and identity in life. 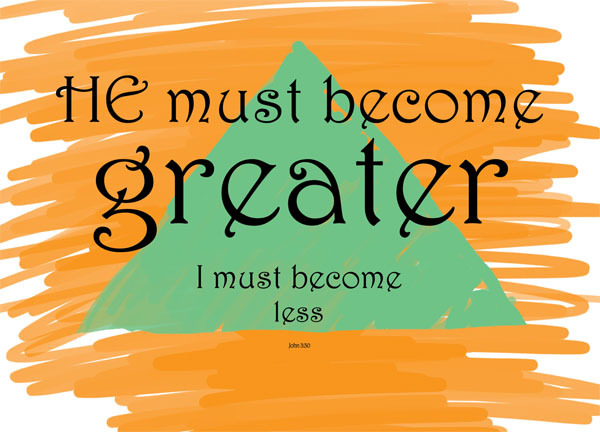 Jesus must become greater, John must become less. Have you ever campaigned for an election in support of somebody? Probably not politics, but perhaps in College, or for some Boat Club or something? Somebody you really respect, but is rather new around town, is running for presidency, and you are running all around town asking people to vote for him because you know everybody and everybody knows you. Suddenly, your brother asks you, why don’t you run for presidency yourself? It’s often like this. The forerunner does a lot of work to pave the way for the candidate into his seat, but the forerunner’s work is often overlooked. Here, John gladly allowed himself to be overlooked. John did become less eventually. Shortly after the beginning of Jesus‘ ministry, John was captured by Herod, and subsequently executed. His influence dwindled, his disciples split. This is what Jesus himself said regarding John the Baptist – I tell you, among those born of women there is no one greater than John; yet the one who is least in the kingdom of God is greater than he [Luke 7:28, Matt 11:11]. Amongst all the ancient prophets, who prophesied about the coming of Christ, John – who prophesied that Christ was amongst them – was the greatest. Yet amongst all those who preached about Christ, John – who in comparison had lesser time spent with Jesus and lesser understanding of the doctrine – was the least. Referring to all the apostles of the early Church and subsequently all the preachers of Christianity, who would be equipped with so much more than what John had to preach and to gospel. It wasn’t a matter of John being inadequate – he was indeed a great man – but merely that his role was completed, and others will continue on from where he left off. I must become less may be a wish, a hope, or a declaration, or even an anticipation – a prophesy. Indeed, John became less, as Christ became great – not just in their influence in each of their short lives, but their significance after their deaths. When the Lord becomes greater, John rejoiced [John 3:29]. He claims a joy that is now complete. A wholesome joy. When we exalt the Lord, we naturally should gain joy. We should rejoice, when we recognise his greatness and might as we exalt him, there is great hope and joy that we can derive from. When we lessen ourselves, deny ourselves, prostrate ourselves in the face of his greatness, it should be a joyful affair. When he increases, our joy increases. Not that I want to take this verse out of context, but the humility of John in putting himself down, making himself smaller in other to exalt the greatness of Christ is something that goes beyond time or circumstances. We’re likely no John the Baptist – we’ve no privilege of claiming to be a forerunner of Christ, who have been sent to make straight the way for the Lord [John 2:23, Isaiah 40:3]. But yet in our own ways we’ve probably put ourselves greater than the Lord. And even if we do put ourselves lesser than the Lord, how often was it not out of obligation or hypocrisy, because there are people watching? How often do we gain complete joy from exalting the Lord and not ourselves? We have perhaps too many ‘I’s in our lives. Let us imitate John the Baptist – the greatest of prophets, yet the least of preachers – let us imitate him in his joy to be lesser, in his joy to make the Lord greater – not only greater in the world, amongst the nations and in the earth, but also in our own hearts. He must become greater, I must become less. I love how the Lord is using you!